Place two small, clean plates in your freezer. In a large deep skillet, combine the strawberries, sugar and liqueur or lemon juice. Heat on medium until the mixture starts to boil. Skim the foam from the top of the jam and discard as it cooks. Don't worry if you can't get all the foam but you should be able to get most of it. Continue cooking and stirring for about 10 minutes or until it starts to thicken. Remove one of the plates from the freezer and put a small spoonful of jam on the plate. Allow it to sit for 30 seconds then tilt the plate. If the jam slides down the plate quickly, keep cooking. If it is slow and thick, it's done. Continue testing, if needed, every 2 minutes. Do not overcook! 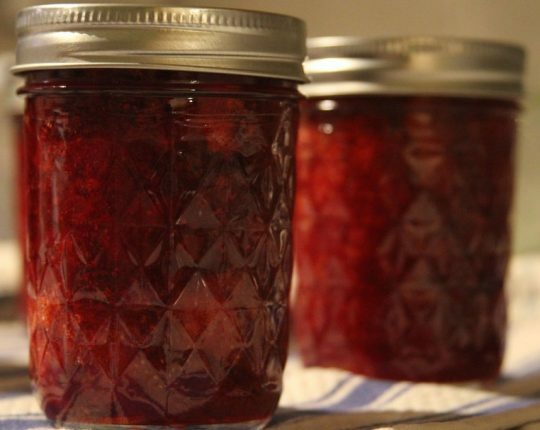 Place the jam in jars and cool to room temperature. Refrigerate once cooled. The jam will keep 2-3 weeks in the refrigerator.